Are you looking for excavating services or excavating contractors in Sydney? 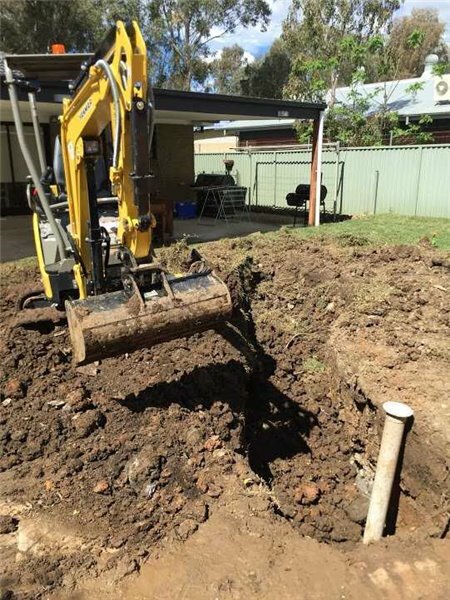 At Rhino Plumbing we have mini excavators for hire that are ideal for digging stormwater pits, sewage pits, installing pipes and lots of other jobs that require a limited access excavation. Trench excavation is hard and dirty work and no-one wants to dig trenches by hand. The best solution for trenching is to hire a mini excavator that can do all of the hard work for you, and move through narrow spaces and around tight corners. Who uses our excavating services? Trenching is essential in the construction industry and is used to dig foundations and ditches to run plumbing, stormwater and sewage pipes. Contractors and builders hire our excavating services, as well as plumbers and electricians (to run cables through the ground). The big telecommunications companies also use them when they are laying new cables. Many home owners also use an excavator for trenching when they are landscaping their yard, digging a pool, putting in a new shed or even a driveway. Excavations are faster and easier when you use a mini excavator, particularly when you need to navigate narrow areas around buildings and squeeze between trees. Why use our excavating services? If you don’t have the right equipment, the job can take a lot longer than you think and cost you a lot more money. When you have a limited access excavation, you can’t use anything less than a mini excavator, otherwise you start to get into the realms of cranes and large excavators that can ruin your yard and set you back a fortune. Our excavators can zip around your yard or work site, avoid obstacles, easily navigate narrow spaces and corners, and turn on a dime. With years of experience and competitive hire rates, you can’t go wrong with Rhino Plumbing excavating services with our expert excavating contractors.